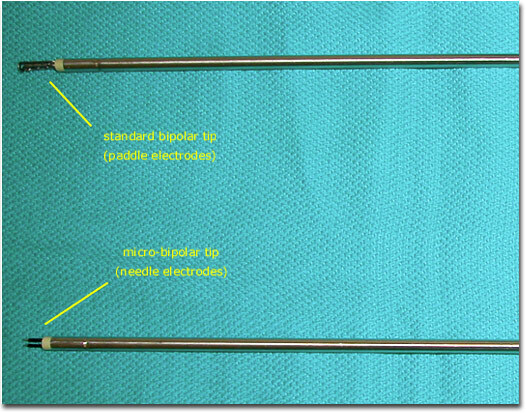 The shape and size of the electrodes (tips) of the bipolar cautery instruments partially determine the amount of tissue that is cauterized. The most common shape for bipolar instrument tips seems to be a paddle configuration (which vary slightly between manufacturers). These tips can grasp a relatively large amount of tissue. Micro-bipolar tips are also available. These are needle electrodes that allow relatively small amounts of tissue to be targeted for cauterization. These needle tips are often used in “infertility surgery” since hemostasis can be established with minimal cautery (excessive devascularization of tissue may result in increased adhesion formation).